We reported in June that thousands of people continue to live in nursing homes and other institutions in spite of a 1999 Supreme Court decision saying people with disabilities should be able to live at home if they want to and are able. 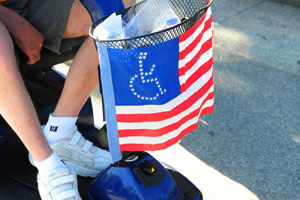 Now, disability activists who have pushed for equal access to community services have scored a big victory in Florida. The Florida Health Care Administration and the Florida Department of Elder Affairs must spend $27 million to improve access to community-based programs for nursing home residents under a settlement agreement this week. The agreement is a result of a class-action lawsuit brought against the state in 2008. The case involved 8,500 people with disabilities living in nursing homes who said they were "unnecessarily institutionalized" because Medicaid would not cover services in the community. According to The Associated Press, a federal court will monitor the arrangement, which requires the improvements to be made during the fiscal year ending June 30, 2010. In their lawsuit, the defendants said that providing services at home would cost the state less. Florida currently spends more than 80 percent of Medicaid long-term funds for elderly and people with disabilities on institutions, including nursing homes. The state spends more than $4 billion a year in Medicaid on long-term care. "This is a positive sign because the amount of the settlement is the kind of amount that will get the attention of policymakers in other states," said Andrew Imparato, president of the American Association of People with Disabilities. Dozens of similar lawsuits have been filed in other states. Currently under Medicaid, people who qualify for the level of service provided by a nursing home can get it because that service is mandatory, but programs that fund community services are not automatic. Some people wait for years to get into state programs that would allow them to have services at home, such as an attendant to help them get out of bed, dress or bathe. Disability activists also had a win in Washington, D.C., this week. Senate Finance Committee Chair, Sen. Max Baucus, added a provision to healthcare reform legislation (PDF) that would increase states' Medicaid match for providing community services rather than placing people in institutions.